Allplan’s integrative software solutions play a crucial role in shaping the design, construction and management of the future. As a central hub we are linking and productively connecting everyone involved in a construction project. Allplan’s specific goal: To support their customers in realizing a better build environment. With the new actionbar in Allplan Architecture 2018, you will find the tools you need for your particular tasks via a series of ribbons. The actionbar is structured according to different roles and tasks so that function groups, such as modeling, drafting or visualization, are available to you. As in a clearly arranged toolbox, you will find all of the appropriate Allplan functions in the respective group and can get to the task at hand straight away. With Allplan Architecture 2018, you can share all kinds of BIM model data, including freeform geometry, to your design partner without any losses. This improves the quality and precision of your BIM model data significantly. Furthermore, IFC4 enables better control across the BIM project and makes the decision making processes easier with all of the key stakeholders involved in the construction project. The new labeling function in Allplan Architecture 2018 ensures consistent and correct labeling of objects within sections and views. Since the labeling is linked with the information in the BIM model, all changes are automatically updated in all of the sections and views linked with the model. 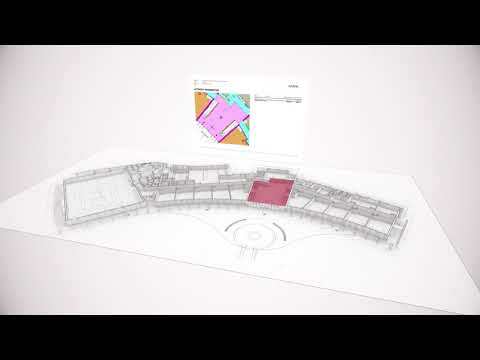 With the combination of Allplan Architecture 2018 and the BIM platform Allplan Bimplus, you can easily handle the exchange of thousands of pieces of information in BIM projects. You can use Allplan Bimplus to centrally define information and then use it in different systems and disciplines throughout the entire life cycle of a building. This makes you more flexible in dealing with information and improves the data exchange via IFC and Allplan Bimplus. Enhanced development in the area of 3D modeling in Allplan Architecture 2018 allows you to implement your visions without compromise and with the highest level of precision. The new features allow for intelligent and enhanced creation and manipulation of freeform 3D objects thus enabling more flexibilty for the modeling of complex curved shapes. Developments in the area of visualization increases and improves the quality of visualization. The CineRender from MAXON, now integrated in Allplan Architecture 2018, allows for the use of physical rendering to achieve even more realistic results. The representation quality of the animation window is also significantly improved. Allplan Architecture 2018 is a universal BIM tool for building construction. Due to its direct connection to the cloud-based Allplan Bimplus BIM platform, Allplan Architecture 2018 becomes a complete BIM solution (up to BIM level 3). As before, you can either work completely in 3D or combined in 2D and 3D, which offers advantages especially in execution planning. The strength of Allplan Architecture lies in reliability and precision across all planning phases, especially in the area of ? ?quantity determination. A large selection of interfaces including IFC import and export ensure secure data exchange with planning partners. Q. I would like to install Allplan, which requires a Product Key. How can I install Allplan or activate the Product Key later? Allplan is using since version 2016 a new protection system. Licensing is based on CodeMeter by Wibu Systems AG since then. You can no longer use Softlock or hardlock with Allplan 2016 and higher. Allplan requires a Product Key. Using this key, you can activate your license online. The Product Key is a unique, 26-digit character string. You can use it to activate a license for Allplan. You can find your Product Key in Allplan Connect. Go to connect.allplan.com/license Note: The license is downwards compatible til version Allplan 2016 even if a higher version is displayed. You can activate a license while you are installing Allplan or after you have installed Allplan. By activating a license, you connect the license with the computer. As a result, you can start Allplan on this computer. The easiest and quickest way to activate a license is to do this online. In other words, the computer has Internet access. To activate the license during installation: Start Setup and follow the instructions displayed. In the 'Installation Option' dialog box, select the Licenser activationoption and click Next. Enter your Product Key. Click Activate license. To activate the license after installation: Open the 'License settings' dialog box: Services application -> Utilities -> License settings. Click License activationon the left. Enter your Product Key. Click Activate license. Q. After I updated Windows (8 to 8.1; 8.1 to 10), Allplan only starts as a viewer. What can I do? Windows update corrupts Nemetschek Softlock License Manager. Fix Nemetschek Softlock License Manager as follows: You can download the current Softlock License Manager. Use the following FTP link: ftp://nemhotline:ha37jvg8f@ftp.nemetschek.de/download/Allplan/2015/NemSLock/ Download the Nemetschek_Software_Lock.exe file. Execute the "Nemetschek Software Lock.exe"file and select "Fix program". After the installation, you can open License Manager again (Services application -> Utilities -> License -> License Manager). Next, install the temporary license (*_psd.nslock): "Install - Install license" You can download the temporary license from Allplan Connect: connect.allplan.com Note: the status of the temporary license is set to "Expired". Next, create a new registration request. To generate a registration request, do the following: Open License Manager (Services application -> Utilities -> License -> License Manager). Select the license entry for your seat and click "Request license". Follow the instructions displayed on screen. Complete the form. Do not forget to enter your email address. Check that the Client ID and CD Key are correct. Q. An error occurs during installation of hotfix 2015-1-11 or later. What can I do? To install this and future Allplan 2015 hotfixes using auto-update, you must update the installation service. Requirement: Allplan 2015-1-10 is installed. 1. You can find a batch file attached to this FAQ. Save and extract this file and execute it on every Allplan workstation (right-click this file -> select "Run as administrator" on the shortcut menu...). The batch file looks for the "InstallAULService.exe" file in the local PRG folder of the Allplan installation and runs it as the administrator. This updates the installation service. Be careful: this requires administrator privileges. If your e-mail program blocks this file, you can also download it from our FTP server. Enter the following address in WindowsExplorer (do not use Internet Explorer! ): ftp://nemhotline:ha37jvg8f@ftp.nemetschek.de/download/Allplan/2015/Hotfix/2015-1/UpdAUL.bat 2. Auto-update should now work as usual. Q. I just installed an upgrade. How can I convert all the projects at once? Back up all the projects beforehand! Do the following: Exit Allplan on all workstations. Only when working with Workgroup Manager: Log in as the Allplan administrator (sysadm). Start the Services application. Only when working with Workgroup Manager: Make sure all the computers where projects are located are up and running. To check this, select: Services application -> Workgroup Manager -> Information -> Display Project List(the second column displays the computer where the project is located). Go to the computer where you want to convert the data and set the drawing file size to the maximum value: Services application->Service ->Hotline Tools->docsize ->512 (or 1024, if available) ->OK Note: After data conversion, you can set the drawing file size back to the initial value. Start converting the data (use the computer where you have changed the drawing file size): Services application ->Service ->Hotline Tools -> datwaprjs: convert data of all projects If you reply "Yes" at the following two prompts, the program will convert the data of all projects. Q. My computer does not have Internet access, but I would like to activate the license with the Product Key. What can I do?